How hybrid economies help keep software honest. Last week’s Plone Conference was truly phenomenal – provocative, intense, and fun (big thanks Jon and ONE/Northwest!). One of the most amazing things I experienced last week was alluded to in Eben Moglen’s keynote (to be posted soon)- the manner in which this community has managed to bring together people who don’t ordinarily interact. Throughout the breakout sessions, I continued to question dividing us up according to our respective vertical sectors – Corporate, Non-Profit, Educational, and Government. As I have begun to write about elsewhere, systems like Plone can help balance the flow of communication and power between people in a variety of situations and settings. Content, collaboration, and community are contexts which exist across sectors, and the tools we all need cross over as well (sometimes with slightly different tunings). In many ways lumping together all the folks involved with education is odd. Universities are microcosms of cities, and their IT needs are as diverse as the the rest of the world. However, there are still structural and social similarities that form the basis for common language and culture. After engaging with my fellow educators a the educational panel session and the BOF session I understood the value of us sharing and strategizing, beyond just commiseration. But through it all, there was one thing that united all of the different attendees – a piece of general purpose software called ‘Plone’. It is worth dwelling on this mixture of participants and the varying forces they apply to the software. Lessig and Benkler have both been writing a great deal about hybrid economies lately, trying to understand their rhythms, and how we might be able to design them to succeed. They have been writing generally about the “commercial economy” and the “second economy” (sharing, social production, etc), but the lessons may cross over directly to our community. I realized in Seattle how beneficial diversity can be for software production. Most of the consultants using Plone are there strictly for traditional market considerations – to make a profit. They are helping to keep the software honest. Unlike some other open source projects which exclusively service the educational world, Plone is not sheltered from the raw, harsh forces of the commercial market. This means that some of the people using Plone use it because it helps them get their jobs done efficiently. Others have called this “productivity arbitrage“, and it is a concept that may hold the key to designing successful open source projects. It is challenging to imagine working backwards and trying to design a software ecology which captures the hearts and minds of such a diverse following. No small task. production.” – Is Plone’s ecology an example of one of these new systems, and if so, what are our distinguishing characteristics? The theory underlying Plone’s personal-ad campaign. At the marketing workshop in Vienna, one of the exercises we conducted was an informal poll of the personality traits and cultural values that people associate with the plone community. Motivating this exercise was an exploration of the recent Plone personal ad, which came out of the New Orleans Symposium. This anthropomorphizing of Plone was meant to embody the idea that software has a personality, and that since writing code is form of creative expression, the values of the author will inevitably be expressed in its features. So, for example, I will be suprised the day that Adobe easily allows for the assignment of Creative Commons licenses to content created using their tools, but no one is surprised by the fact that the Mediawiki wiki-engine deafualts to this license. If you accept this position, then selecting the right CMS is more than a matter checking off features on a matix. It becomes essential that the vendor’s values are consistent with the client’s mission. In the case of an open source project, the “vendor” is really an entire ecology, comprised of of the community, the software, and the processes and structures which bind them together. To be sure, many of these qualities are characteristic of Open Source, and beyond. But this dimension of analysis is missing from most RFPs. Pull over Kitt – you’ve just been lapped. On Monday November 14th I attended a presentation by Sebastian Thrun, an AI researcher at Stanford U. whose team recently won the Darpa Grand Challenge. The idea behind the Grand Challenge is to accomplish something that seems impossible, along the lines of crossing the Atlantic, the X-prize, etc. Darpa had previously funded cars that drive themselves, but after numerous failures decided to turn the task into a contest and see how far teams would get in a competitive setting. Last year none of the entrants managed to finish the course, but this year 5 finished, 4 within the alloted time. The difference between last year and this year was primarily improvements in software, not hardware. In fact, once the software has been developed, outfitting a car with the necessary equipment to drive itself (the perceptual apparatus – laser, radar, and video guidance, the gps, the inertial motion systems, the general purpose computing servers, and the fly-by-wire control systems), were estimated by Sebastian to cost the robots are already here (some of them killer)! This weekend I attended the masterfully produced Slavery in New York exhibit at the New York Historical Society. The exhibit was deeply moving, and vividly and viscerally captured a portrait of African American history I was not fully aware of previously. I left the exhibit with a new understanding of how the 400 year long institution of slavery was a tragedy fully on par with the Nazi Holacaust. I will save a discussion of the show’s content for another time, but for now I want to focus on the amazing use of educational technology woven throughout the exhibit. From start to finish, the show effectively incorporated video, interactive kiosks, and innovative displays which pushed the boundaries of some of the best work I have seen in this field. The use of screens is a topic that is on my mind from my studies of Lev Manovich this semester, and this exhibit incorporated many cutting edge treatments of the screen. To start with, at the beginning of the exhibit, the visitor is confronted with video commentary of the reactions of past visitors, and at the end of the exhibit a self-service video booth allowed visitors to record their own commentary. I have never seen a self-service video booth like this incorporated into an museum exhibition, and it was very powerful and impressive. Beyond that, their ability to transport the visitor to the reality of the past was greatly enhanced by their translation of historical abstractions to modern day interfaces. In particular, I am thinking of the classified ads advertising slaves for sale and offering rewards for runaways, the presentation of the slave ship logs, and most strikingly, the presentation of the slave economy in a bloomberg-style terminal. The cold economics of slavery were driven home by the scrolling marquee listing the numbers of Negros arriving on incoming ships, and the fluctuating going rates of various skills. The incorporation of video throughout the exhibit, from overhearing the conversation of slaves gathered around a well (in a brilliant interface), to the dialogue between the portraits of ornately framed talking heads, to the interactive choose-your-own-adventure kiosks was incredibly well done, and offered accessibility and deep learning even to the fragmented attentions of the postmodern era. I highly recommend visiting this exhibition, as the web site barely begins to do it justice. On October 27th I attended a University Seminar presented by Mark Phillipson. The seminar was lively and well attended, and Mark managed to connect the culture of wikis with their open source roots. Sometime soon I plan on elaborating on ways in which software, as a form of creative expression, inevitably expresses the values of the creators in the form of features. But right now I want to focus on the taxonomy of educational wiki implementations that Mark has identified since he began working with them. A website whose primary function is to create a repository of knowledge on a particular topic. An environment that provides tools for detailed exegesis on primary sources, where the students are instructed to leave the source material unchanged, and create subpages with detailed commentary on supplemental pages. I think this taxonomy is accurate, but doesn’t completely capture one of the most interesting educational implications of wikis – the process of creating them. In particular, I can think of a number of variations on the repository/reference wiki, where the final products might all look similar, but where the “collaboration index” might differ substantially (for more on the popularity of the repository/reference, see Database as a Symbolic form, Manovich 2001). Wikis are a very flexible tool, whose usage can vary from a personal publishing tool, to a simple Content Management System, to a collaborative authoring environment. Additionally, while wiki software doesn’t usually support the enforcement of a strict workflow, policy can be stipulated and adhered to by convention (like in Mark’s class, where the original poems were meant to be left intact). A simple means for instructors to publish and organize information for their class. Students dividing large assignments amongst themselves, each sharing their own results with the group. 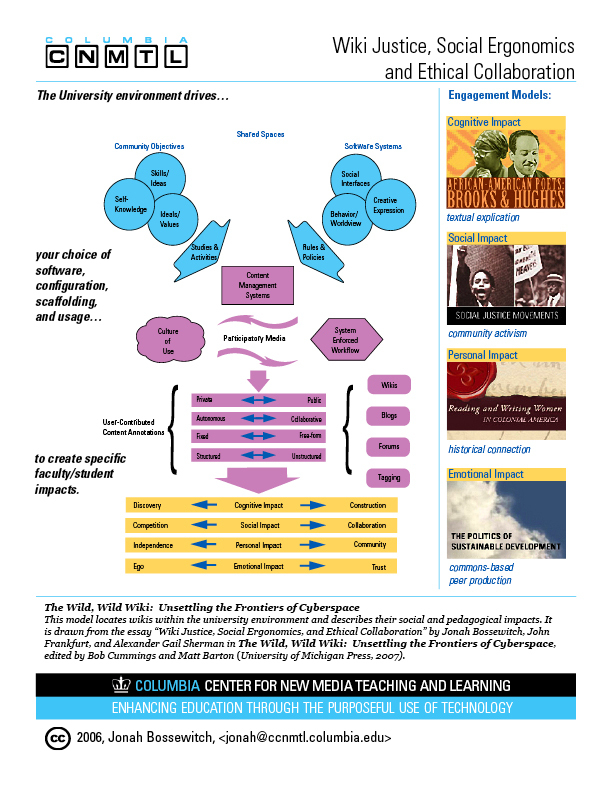 A site like the social justice wiki where groups of 3-4 students each worked on a reference element of the site. Common Resources, Glossary of Terms, and the larger information architecture and organization of the entire site. Also, consider that due to their flexibility, many wikis end up being repurposed beyond their original conception, and begin to serve as portals, where many meta-issues and conversations can take place beyond the assembly of the content itself. Some of these tasks include mundane administrative work, like students forming groups, coordinating assignments, taking minutes, and scheduling time. While the end results of many of these collaborations might certainly all look similar to each other , perhaps the differences in the process by which this content is developed is crucial in capturing part of what is happening with wikis in the classroom. This analysis probably also has implications relating to the archiving and the use of a wiki environment in a classroom over time. If the act of creating the wiki is central to what the students are supposed to learn from the exercise, then should they start with a fresh wiki every semester? How is the experience different when they are contributing to an existing system (or even have access to prior versions of the project)? For more on this, see Mark’s comment’s on CCNMTL’s musings blog.